Mervyn King, former Governor of the Bank of England, and professor of economics at LSE, recently published a book, The End of Alchemy, containing his reflections on the current state of economic theory and policy from the special vantage point of someone who has been a practitioner of both callings at the highest levels. Paul Krugman has a review of King’s book in the current edition of the New York Review of Books. Krugman points out that King’s tenure at the Bank of England coincided with that of Ben Bernanke, also an academic economist of some renown before embarking on a second career as a central banker, and who has also published a book about his experience as a central banker. A quick check of the Wikipedia article about King reveals a fact left unmentioned by Krugman: that while a Kennedy Scholar at MIT in the late 1970s, King actually shared an office with the young Ben Bernanke who was then working on his Ph. D. at MIT. In his review, Krugman observes that, unlike Bernanke’s recent memoir, King’s book is less an account of his tenure as a central banker during the 2008 financial crisis and its aftermath than it is a “meditation on monetary theory and the methodology of economics.” Here’s how Krugman describes King’s book. King’s book is, instead, devoted to “economic ideas.” It is rich in wide-ranging historical detail, with many stories I didn’t know—the desperate shortage of banknotes at the outbreak of World War I, the remarkable emergence of the “Swiss dinar” (old Iraqi notes printed from Swiss plates) in Kurdistan. But it is mainly an extended meditation on monetary theory and the methodology of economics. And a fascinating meditation it is. As I’ll explain shortly, King takes sides in a long-running dispute between mainstream economic analysis and a more or less radical fringe that rejects the mainstream’s methods—and comes down on the side of the radical fringe. The policy implications of his methodological radicalism aren’t as clear or, I’d argue, as persuasive as one might like, but he definitely challenges policy as well as research orthodoxy. You don’t have to agree with everything King says—and I don’t—to be impressed by his willingness to let his freak flag fly. His assertion that we haven’t done nearly enough to head off the next financial crisis will, I think, receive wide assent; I don’t know anyone who thinks, for example, that the US financial reforms enacted in 2010 were sufficient. But his assertion that the whole intellectual frame we’ve been using is more or less irreparably flawed is a brave position that should produce a lot of soul-searching among both economists and policy officials. I don’t want to discuss Krugman’s review in detail, but I was struck by a passage toward the end of the review in which Krugman takes issue with King’s rather pessimistic assessment of the possibility that central bankers or economic policy makers can do much to improve an economy that is underperforming. In any case, King’s policy proposals don’t stop with banking reform. He also weighs in on macroeconomic policy, on how to fight the economic weakness that has persisted long after the acute phase of the financial crisis ended. He dismisses talk of demographic and other “headwinds”—such as an aging population—that may be holding the economy back. What has happened, he declares, is a change in the narrative that consumers are telling themselves to a story far more pessimistic about what the future might hold, leading them to spend less year after year. And then a funny thing happens: his radical views on economics lead him to what would ordinarily be considered conservative, even boringly orthodox policy recommendations. The conventional Keynesian view . . . is that what we need in the face of persistent weakness is policies to boost demand. Keep interest rates low, and maybe raise inflation targets to further encourage people to spend rather than hoard. Have government take advantage of incredibly low interest rates by borrowing and spending on much-needed infrastructure. Offer relief to individuals and nations crippled by debt. And so on. Monetary stimulus via low interest rates works largely by giving incentives to bring forward spending from the future to the present. But this is a short-term effect. After a time, tomorrow becomes today. Then we have to repeat the exercise and bring forward spending from the new tomorrow to the new today. As time passes, we will be digging larger and larger holes in future demand. The result is a self-reinforcing path of weak growth in the economy. Is this argument right, analytically? I’d like to see King lay out a specific model for his claims, because I suspect that this is exactly the kind of situation in which words alone can create an illusion of logical coherence that dissipates when you try to do the math. Also, it’s unclear what this has to do with radical uncertainty. But this is a topic that really should be hashed out in technical working papers. I must admit to being a surprised – and disappointed – that Krugman gave such a mild response to King’s argument, which seems to me obviously problematic rather than, as Krugman implies, plausible, but potentially disprovable if subjected to sufficiently rigorous mathematical scrutiny. The problem is not whether you can produce a mathematical model that generates the result King has asserted. It’s really not that hard for a smart theorist to work out a mathematical model that will generate whatever result he or she wants to generate. The problem is whether the result corresponds to any plausible state of the world, so that one could specify the conditions under which the result of the model would be relevant for policy. But the argument for stimulus to which King is objecting is that the economy is operating at a lower time path of output and employment than the path at which it is capable of operating; actual output over time is less than potential output over time. Thus, if you stimulate the economy and increase output now, the economy will move to a path that is closer to its potential than the current path. King’s argument, at least as reproduced by Krugman, is simply irrelevant to the question whether a stimulus can move an economy from a lower time path of output to a higher time path of output. The trade-off that supposedly exists in King’s argument is not a real trade-off. So the issue is, not the model, but the underlying assumption about what the initial conditions are. Is the economy operating at its potential or is operating at less than its potential. If King is right about the initial conditions – if the economy is already operating as well as it could – then he is right that stimulus is futile and increasing output now may decrease output in the future (presumably by reducing investment that would generate increased future output). But if he is wrong about the initial conditions – if the economy is not operating as well as it could – then the increase in output resulting from a stimulus does not imply any reduction in future output; it merely prevents a loss of current output that would otherwise be – avoidably – wasted. King’s argument is actually not an argument – at least insofar as Krugman has accurately characterized it – it is just question begging. The New York Times finally caught on today that the gold bubble is bursting, months after I had alerted the blogosphere. But even though I haven’t received much credit for scooping the Times, I am still happy to see that word that the bubble has burst is spreading. Gold, pride of Croesus and store of wealth since time immemorial, has turned out to be a very bad investment of late. A mere two years after its price raced to a nominal high, gold is sinking — fast. Its price has fallen 17 percent since late 2011. Wednesday was another bad day for gold: the price of bullion dropped $28 to $1,558 an ounce. It is a remarkable turnabout for an investment that many have long regarded as one of the safest of all. The decline has been so swift that some Wall Street analysts are declaring the end of a golden age of gold. The stakes are high: the last time the metal went through a patch like this, in the 1980s, its price took 30 years to recover. What went wrong? The answer, in part, lies in what went right. Analysts say gold is losing its allure after an astonishing 650 percent rally from August 1999 to August 2011. Fast-money hedge fund managers and ordinary savers alike flocked to gold, that haven of havens, when the world economy teetered on the brink in 2009. Now, the worst of the Great Recession has passed. Things are looking up for the economy and, as a result, down for gold. On top of that, concern that the loose monetary policy at Federal Reserve might set off inflation — a prospect that drove investors to gold — have so far proved to be unfounded. And so Wall Street is growing increasingly bearish on gold, an investment that banks and others had deftly marketed to the masses only a few years ago. On Wednesday, Goldman Sachs became the latest big bank to predict further declines, forecasting that the price of gold would sink to $1,390 within a year, down 11 percent from where it traded on Wednesday. Société Générale of France last week issued a report titled, “The End of the Gold Era,” which said the price should fall to $1,375 by the end of the year and could keep falling for years. Granted, gold has gone through booms and busts before, including at least two from its peak in 1980, when it traded at $835, to its high in 2011. And anyone who bought gold in 1999 and held on has done far better than the average stock market investor. Even after the recent decline, gold is still up 515 percent. But for a generation of investors, the golden decade created the illusion that the metal would keep rising forever. The financial industry seized on such hopes to market a growing range of gold investments, making the current downturn in gold felt more widely than previous ones. That triumph of marketing gold was apparent in an April 2011 poll by Gallup, which found that 34 percent of Americans thought that gold was the best long-term investment, more than another other investment category, including real estate and mutual funds. It is hard to know just how much money ordinary Americans plowed into gold, given the array of investment vehicles, including government-minted coins, publicly traded commodity funds, mining company stocks and physical bullion. But $5 billion that flowed into gold-focused mutual funds in 2009 and 2010, according to Morningstar, helped the funds reach a peak value of $26.3 billion. Since hitting a peak in April 2011, those funds have lost half of their value. The smart money is getting out fast. Investment professionals, who have focused many of their bets on gold exchange-traded funds, or E.T.F.’s, have been faster than retail investors to catch wind of gold’s changing fortune. The outflow at the most popular E.T.F., the SPDR Gold Shares, was the biggest of any E.T.F. in the first quarter of this year as hedge funds and traders pulled out $6.6 billion, according to the data firm IndexUniverse. Two prominent hedge fund managers who had taken big positions in gold E.T.F.’s, George Soros and Louis M. Bacon, sold in the last quarter of 2012, according to recent regulatory filings. And if you happen to think that the nearly $400 an ounce drop in the price of gold since it peaked in 2011 is no big deal, have a look at these two graphs. 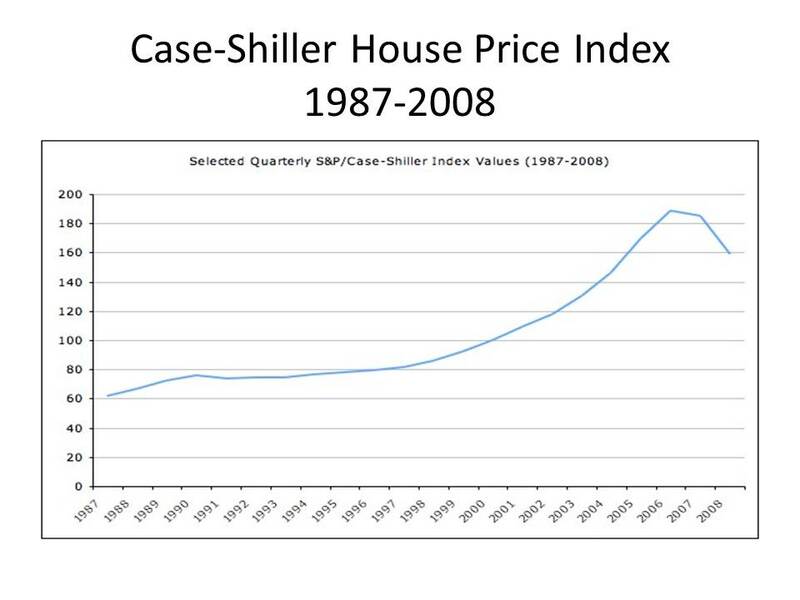 The first is the Case-Shiller house price index from 1987 to 2008. 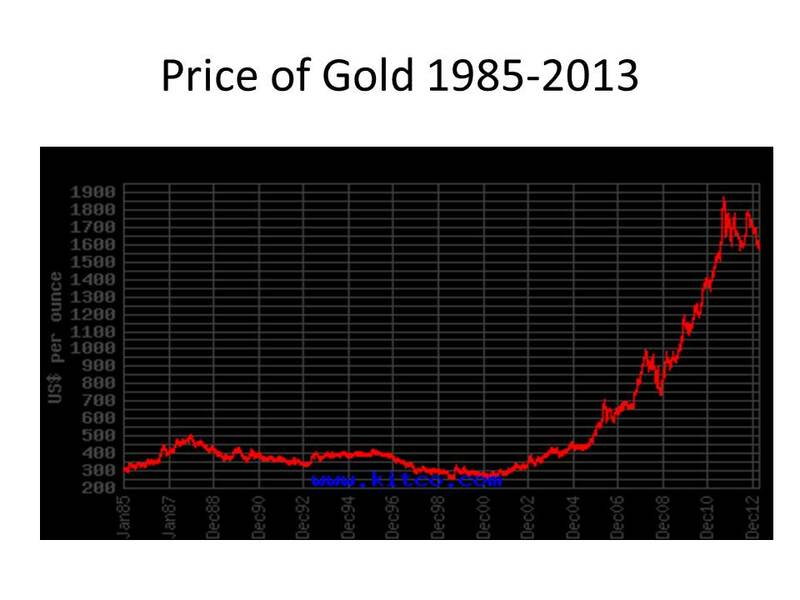 The second is the price of gold from 1985 to 2013. Of course now that it is semi-official that the gold bubble has burst, isn’t it time to start looking for someone to blame it on? I mean we blamed Greenspan and Bernanke for the housing bubble, right. There must be someone (or two, or three) to blame for the gold bubble. Juliet Lapidos, on the editorial page editor’s blog of the Times, points an accusing finger at Ron Paul, dredging up quotes like this from the sagacious Congressman. As the fiat money pyramid crumbles, gold retains its luster. Rather than being the barbarous relic Keynesians have tried to lead us to believe it is, gold is, as the Bundesbank president put it, ‘a timeless classic.’ The defamation of gold wrought by central banks and governments is because gold exposes the devaluation of fiat currencies and the flawed policies of government. Governments hate gold because the people cannot be fooled by it. Fooled by gold? No way. But the honorable Mr. Paul is surely not alone in beating the drums for gold. If he were still alive, it would have been nice to question Murray Rothbard about his role in feeding gold mania. But we still have Rothbard’s partner Lew Rockwell with us, maybe we should ask him for his take on the gold bubble. Indeed, inquiring minds want to know: what is the Austrian explanation for the gold bubble?